I started to play keyboard on the (electronic) organ ORLA which was to my sister. It was a keyboard of three octaves and half which had four timbres (tones) with very evocative names. Unfortunately there was only the name, the sound did not resemble nothing ! Later, well before appear the digital instruments, I played on various instruments, all analog of course. I played with various keyboards like a KAWAI 100F, YAMAHA SY1, a ELKA Rhapsody-61, a HOHNER Clavinet D7, a HOHNER Pianet-T. In a store, I even fiddle about a ROLAND Jupiter-8 (I do not even know if the tradesman succeeded in selling it so much it were expensive: 40.000 FRF of the time ! ), a SCI Prophet 5 (expensive too ! ), KORG MS20 and Lambda, ROLAND SH-9, etc. Minou, a friend of childhood, took me along one day at one of its knowledge which had, enter others, a EMS Synthi AKS. Extraordinary Machine ! In studio recording, I play on (with ?) MiniMoog, a Fender piano and Mellotron M400, an incommensurable happiness ! From this time - 1976 to 1982, I have Pianet T, a pedal of volume, and bad Phaser (analog !) which I do not remember any more manufacturer. Afterwards, I crossed a period without feeling then the need to express me through the music. What did not prevent me from holding me with the current thanks to the specializes magazines or the discussions with friends. I did not take part at the beginning of the "numerical music technology" and of MIDI like did some of my friends. I "tinkered" music on my Atari ST - bought in 1987 - with software which tried to exploit the poor sound chip of the machine (polyphony: 3 voices, Amiga did better with 4 !). 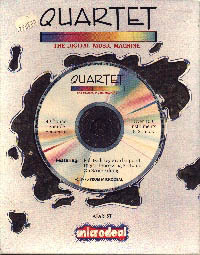 In 1990, I read an article, in a magazine dedicated to Atari, on a new musical software which exploited samples: QUARTET from Microdeal. It was about "Tracker" directed musical notation towards a range (at all as Trackers of today where the guy who knows there nothing in musical theory can assemble sounds in "loop" because there is a good algorithm of harmonization which arranges the whole there to him..., I will not make buddies ! ). It could also be controlled by MIDI. This software could produce 4 voices of polyphony, and 4 ways of multitimbrality. I have bought it and I started to compose with the mouse: note by note, score by score (I even took again some of the compos which I had done with !). 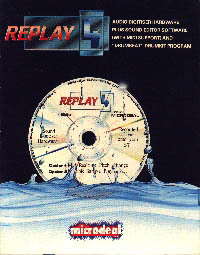 I bought to it Replay-4 cartouche thereafter, from Microdeal always. This electronic extension made it possible to enter (sampling) or leave the sounds of Atari with these audio jack (RCA) "Input" and "Output". With this one, I sampled (in 8 bits) sounds drawn from discs (vinyl). I triturated them in a software to put them at the Quartet format… There, I believe well that the virus of the music had begun again to me !